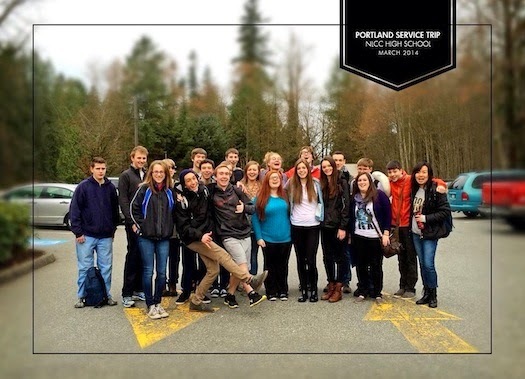 Last week, a team of 21 people from my church's high school ministry embarked on a five-day service trip to Portland, Oregon, my favourite city in the United States. I absolutely love service and missions trips--students get outside of their everyday lives and learn how to work as a team, do uncomfortable and awkward tasks, have spiritual conversations with people, and put their faith into action. God always does incredible things in students' hearts during these experiences, and, when served with intentionality, the ministries we partner with are also blessed by the students' service. On our first full day in Portland, we parked at Lloyd Center and took the MAX to downtown, where we set the students loose to wander for a few hours and make at least ten observations about the city. After a trip to Voodoo Donuts and Powell's City of Books, we went back for a time of debrief and prayer. It was awesome to see students opening their eyes, ears, and hearts to the city, noticing cultural differences between Canada and the US in ways they hadn't before, and growing in their love for new places and people. On Wednesday, we spent the entire day serving with Union Gospel Mission, both at their downtown ministry and their thrift store in Tigard. 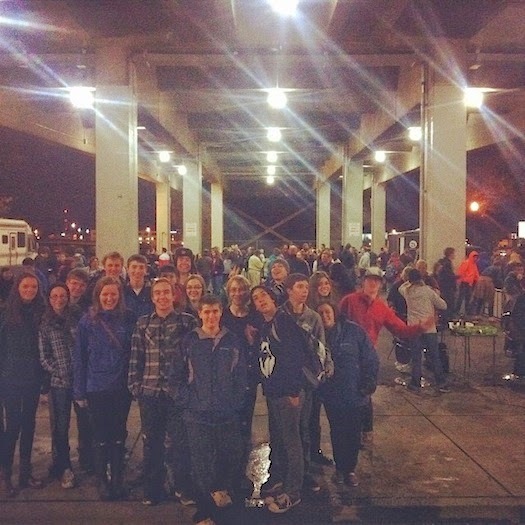 Our students were thrown into service, handing out food, coffee, and clothing to the homeless guests. After initial fear and intimidation, the students began to slowly engage in conversations with the guests, learning names, listening to stories, and even celebrating one guy's birthday (he was 47 that day). We closed the day with a Lenten dinner at St. Matthew Lutheran Church, our gracious hosts, and attended an evening service. Our students learned a lot about Lutheran practices and liturgy, and the experience expanded our horizons regarding the body of Christ--these Mennonite Brethren students were getting a taste of how others in the kingdom do church. On Thursday, we partnered with Shepherd's Door, a ministry of Portland Rescue Mission to mothers caught in a life of addiction and poverty. Our students did loads of gardening and yard work in the women's community garden, working so quickly that the SD staff didn't have enough for us to do. After getting showers at my former stomping grounds, Hinson Church, and exploring the weirdness of SE Hawthorne Blvd, we closed our evening by participating in Night Strike. A small group from our team went out on a prayer walk through the city while the rest were hosts under the Burnside Bridge, having conversations with the homeless guests and praying for those around us. 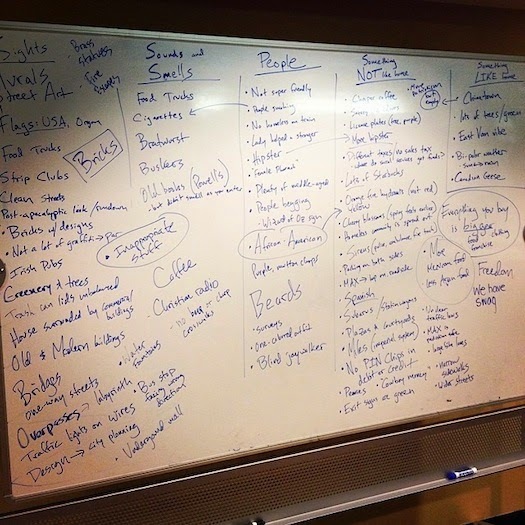 What began as an uncomfortable and difficult experience turned into a transformative event for many of our students. Prayers were answered in the moment; deep conversations happened in unexpected ways; students overcame their fears in the name of Jesus. A significant highlight for me was seeing a diverse team of students grow in their love for one another. Many of the students didn't even know each other's names before the trip. By the end, they were laughing and serving together, playing card games and singing along to the "Frozen" soundtrack on the drive home to BC. Many quieter students broke out of their shells, and there weren't any cliques or huge conflicts during the week. It was a week defined by friendship--these students are now genuine friends, having experienced something beautiful together in the uniting love of Jesus. During a time of reflection and debrief at the end of the trip, I wrote the following in my journal: "Portland was a trip where I saw God's uniting and gracious love at work. Where a team of students became the body of Christ through serving others and building each other up, and where our eyes were opened to bigger visions of who God is and how He is at work in the world around us. God's love is both greater and more intimate than before." Thanks to our church family for your prayers, to the parents of students for the willingness to send your teens on a service trip, and to Jesus, whose love is gracious and patient and redemptive. It sounds like you had a great time of learning and ministry. Thanks you NLCC youth and Leaders for representing God and NLCC in Portland. Thank you Joel for all of the work and prayer you put into organizing these trips for our youth. It is such a blessing to see these young people serving Jesus together and learning what it means to be one of Christ's disciplines in such real and tangible ways.